Christmas In The Vineyard: Vineyard Music EXTRA! Anaheim, California  Christmas In The Vineyard is a recording of 15 Christmas classics featuring timeless renditions of the most beloved songs ever written foretelling the birth of our Lord and Savior Jesus Christ. 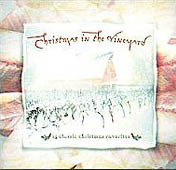 Christmas In The Vineyard was recorded in a small group worship setting and features such prolific worship leaders as Scott Underwood, Andy Park, Eddie Espinosa, Cindy Rethmeier, Terry Butler Larry Hampton, Brent Helming. Album highlights include We Three Kings, O Come All Ye Faithful and Away In A Manger. Because the songs were recorded with heart-felt worship Christmas In The Vineyard presents traditional songs in a way that invites the listener to partake in intimate worship with our loving Savior. Songs include: Angels We Have Heard On High; We Three Kings; O Come All Ye Faithful; God Rest Ye Merry Gentlemen; O Come, O Come Emmanuel; Silent Night; Hark! The Herald Angels Sing; O Holy Night; Do You Hear What I Hear; Away In A Manger; What Child Is This; The First Noel; O Little Town Of Bethlehem; It Came Upon A Midnight Clear; Joy To The World. (Release Date: September 22, 1998).